Fresh home designs for retiring Baby Boomer are less conventional than prior generations of home designs. Open floor plans, indoor-outdoor integration and privacy are big, according to AV Homes, an active adult community builder in Florida and Arizona. Tempered by new realities following the Great Recession, the nation’s 78-million Baby Boomers are once again primed to challenge the establishment. This time their target is homebuilding where they are beginning to reshape retirement living, especially as it applies to their homes. “Today’s active adult community home buyers are less conventional in their preferences than prior generations of retirees. They don’t want redundant space. They don’t want to be segregated or compartmentalized in their home. They live with everything wide open, wanting to be a part of the action,” said Mike Woodley, principle of the award-winning Woodley Architecture Group. Woodley and his team recently took a lead role in addressing this new dynamic on retirement living when they were selected to work with active adult community builder AV Homes to design 16 new floor plans for its 55+ community, Solivita, located near Orlando Florida. During the six-month planning and design process, Woodley actually lived in Solivita to gain a better understanding of how the home buyers actually “lived” in their homes. “Our home buyers were starting to talk to us about things like the integration of interior and exteriors spaces. They wanted the outdoors to become an extension of the home’s living space,” said Ken Plonski, a Senior Vice President with AV Homes. “They were moving toward more open designs that enhance the social livability of the home. Family and friends are central elements in their lifestyle,” he added. So what did Woodley learn during his residency at Solivita? “Retiring Boomers don’t need as much space. Their value is not placed on how big the home is, but how well it lives. This is a shift in thinking as prior generations have valued the cost per square foot as the guide. You don’t buy a car by the pound so why would you buy a home simply based on the square footage and not the livability,” Woodley asked. In another paradigm-shifting move, AV Homes hired the interior design firm L2 Studios in Orlando to join the team. L2 is a company that has worked primarily in the hospitality industry. “We wanted to bring some new ideas to the table and that’s just what they did,” said Plonski. Debra Lemons, President of L2, assembled a team that toured the state of Florida and then developed a design platform centered around the different architectural characteristics of the state. “Each of our 12 model homes presents itself differently. L2 captured Miami chic, Ocala’s horse country appeal, the retro style of the Space Coast, and the laid back lifestyle of the Keys, just to list a few,” Plonski said. Each home has a memory point and the interior designs are proving to be very appealing to a new generation of active adult buyers who have broken away from the traditional designs of the past. On the new model park’s opening weekend more than 3,000 people toured the models and more than 50 homes have already been sold. The new models also received acclaim from some of the active adult industry’s top design experts. At the recent NAHB 50+ Housing Council awards ceremony held in Las Vegas, NV, AV Homes was honored for its innovation. Solivita’s Jacksonville model received a Gold award for Best Detached Home over 2,100 square feet, and its Panhandle model won the Silver award for Best Detached Home under 2,100 square feet. The National Association of Home Builders’ (NAHB) long-term forecast indicates that the share of 55+ households will grow every year through 2019, when the 55+ category will account for nearly 45 percent of all U.S. households. The organization is also projecting home starts in 55+ communities to grow by more than 20% in 2013 and 2014. "Boomers are sensing a stronger resale market and improving home appreciation and these factors are bringing them back into the market. When they arrive at Solivita, they’re going to find fresh new designs suited to the way they live today,” Plonski added. 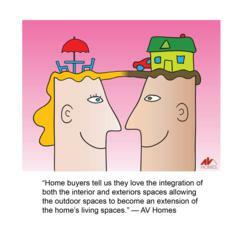 AV Homes, Inc. is engaged in homebuilding and community development in Florida and Arizona. Its principal operations are conducted under its Vitalia active adult brand http://www.vitaliahomes.com at Solivita near Orlando, Florida, Vitalia at Tradition in Port St. Lucie, Florida, and CantaMia near Phoenix, Arizona. The company also builds conventional communities for people of all ages in the Orlando and Phoenix areas under its Joseph Carl Homes brand. AV Homes is publicly held and traded on NASDAQ under the symbol AVHI.